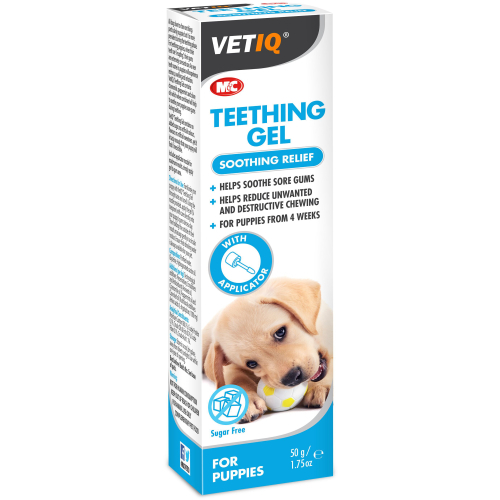 Mark & Chappell VetIQ Teething gel is a tasty supplement specially formulated to meet the specific needs of teething puppies. Containing natural calming and soothing properties, these provide relief to your puppy’s sore gums. VetIQ Teething gel is free from added sugar, artificial colours, flavours and artificial sweeteners. •	Helps to calm and soothe sore gums. •	Suitable for puppies from 4 weeks of age. •	Contains soothing Chamomile, Peppermint & Clove oils. Acts as a natural mild anaesthetic and evokes a cooling effect on the gums which gives a soothing sensation. It has local anaesthetic and counter irritant properties and produces a cooling effect. Therapeutic properties of menthol are germicidal and are also known to reduce itching and tenderness which is associated with teething. Powerful antibacterial proven to relieve and deaden dental pain. Acts on central nervous system stimulating a calming effect. Cloves active component eugenol is an effective local anaesthetic and has been used for a long time in dentistry.